Fear is like a group of annoying relatives. You can't avoid them forever, and ignoring them won't make them go away. Even the most courageous person holds a personal set of anxieties. We often allow worry, fear and doubt control and define our lives. If you don't learn to face your fears it will seize your mind, body, and spirit. 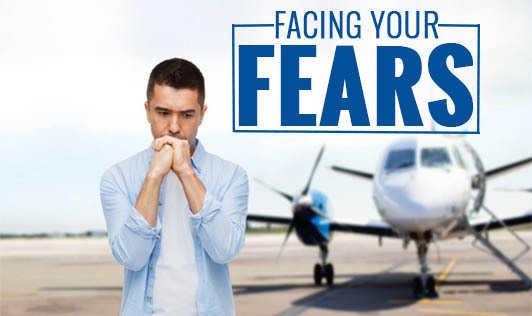 Once you understand how you can dispel fear, it shrinks and is no longer a threat. With the right type of thinking, you'll wonder why you weren't doing it earlier! Get comfortable with fear. Do the things that frighten you, as action builds courage. Tell yourself that, "This fear will pass". Your world will expand as your readiness to grow expands. Record your fears. Write about your fears in a journal. Take time out and without judgement, reflect on what you've written. This will give you an insight and loosen fears by observing it. Remember when you write down your fear, fear loses its power over you. Dwell on abundance. You need to learn to think, speak, and live as an abundant person to face fear. Avoid paying attention to negative media. Celebrate what you have. Focus on being ready, willing, and be prepared for the wonder, connections, good fortune, favourable circumstances that are yours if you're willing to work and be open to it. Revisit your success. Strengthen your belief in yourself by reflecting on your past victories. Close your eyes and feel the special emotion of each one. Bring in the same, persistence and talent into the present and allow it to inspire and motivate you. Think positive. Fearful thoughts will only attract more fear. Positive thoughts attract success. So instead of expecting the worst, take time to train your mind to expect the best. Relax your body. Unclench your jaw, open your fists, slow down your pounding heart and breathe. Take short relaxation breaks throughout your day. You need to learn to live in a relaxed state. Plan to be great. Step into your power and dream big. You need to follow it up with calculated risks and conscious action. Remember that you have the power to do what it takes to break through any fear that may stand in the way of yourself, your dreams, and your success!